I’m not sure if they do it anymore, but for some tears the Concordia (university) Amateur Radio Club would operate field day from downtown here in Montreal. It lacked the camping aspect, but was a much better location to reach the public. All those people passing by, but for those who deliberately wanted to see the operation, more accessible than out in the country. So they set up outside the main building, and used the existing antennas on the roof, just longer coax feed. 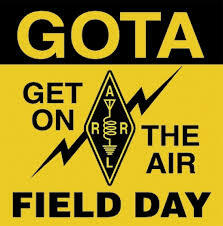 An earlier ARL bulletin listed some US stations with special permission to operate on the LF bands that would be operating during Field Day. There’s one in Vermont that I’m going to try to listen for, not that I have any LF antenna up. It’s ben 45 years since the first Field Day I went to. I’d passed the rest immediately before, but the license didn’t arrive till a week or two into July. That year, 1972, the Montreal Amateur Radio Club set up on the island that had been used for Expo 67. I remember a fairly raining weekend, the peripheral of some hurricane. Someone brought their FT-101, the first time I saw one live, and still relatively new at the time. So portable, complete with a handle on the side (which became more common later). Don’t forget, Canadian hams can use special prefixes this year, for Canada’s 150th. The scheme doesn’t quite make sense, but it’s there for hams who want to use it.